A surprising number of things can be modeled by using Follow Me to perform a lathe operation. A lathe is a tool that carpenters (and machinists) use to spin a block of raw material while they carve into it — that’s how baseball bats are made (the good ones, anyway). Draw a circle on the ground. Rotate a copy of your circle up by 90 degrees. Select the face of your circle with the Select tool and then choose Tools→Rotate to activate the Rotate tool. Press the Ctrl key (Option on a Mac) to tell SketchUp you want to make a copy. Click a green endpoint inference along the edge of your circle and hold down your mouse button to drag. Don’t let go just yet. Still dragging, move your cursor over to the endpoint on the exact opposite side of your circle; then release your mouse button. Your axis of rotation is a line right through the center of your circle. Click anywhere on the edge of your circle and then move your mouse over a little bit. Type 90 and press Enter. Make sure that one of your circles is selected. With the Follow Me tool (choose Tools→Follow Me), click the circle that’s not selected. Now you have a sphere. The Follow Me tool lathed your circular face around the path you selected — the other circle. If you really need a sphere, the easiest way to get one is in the Components dialog box. Type sphere into the 3D Warehouse search box, then press Enter on your keyboard. Something useful should appear. Under typical circumstances, you only have to model half a profile to use Follow Me to make it three-dimensional. 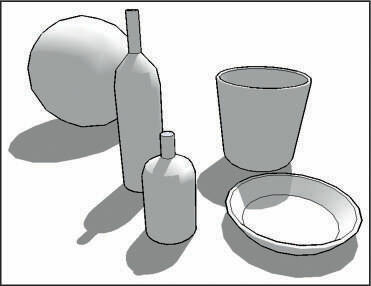 The following figure shows a few examples of 3D objects.